Grooms are so lucky! There are now hundreds of suppliers whose aim is to make the groom rock his look and make it as personal to him as can be. Tails and a top hat are no longer the staple attire for every groom. Guys can add details to their outfit which not only will make it unique to them, but also means these stylish grooms will also feel comfortable throughout the day. So let me show you how past grooms of mine have added detail, colour and style to their day. Getting married in Warmer climates? Aren’t really a suit kinda guy? Then ditch the tie and loose the jacket, roll up those sleeves and enjoy just how comfortable you feel on your day. A lot of my grooms are from creative industries, many don't wear suits to work, and so the idea of wearing a full three piece, tails or a cravat is out of the question. So don't force yourself to wear anything that you aren't comfortable in, it'll just make you uneasy and on edge throughout the day; which in turn will come across in your photography and videography...and no one wants to look awkward on camera. So ditch the idea of a full suit, if you're getting married and the weather turns out to be scorching, don't fret over having to 'stay' in your suit. Take off your jacket and cool down! I know you want to look smart in all those candid shots, but beads of sweat on your forehead will be a bit of a giveaway. We all want lovely weather on a wedding day; so if you are lucky to get it, adjust your attire throughout the day to suit it. 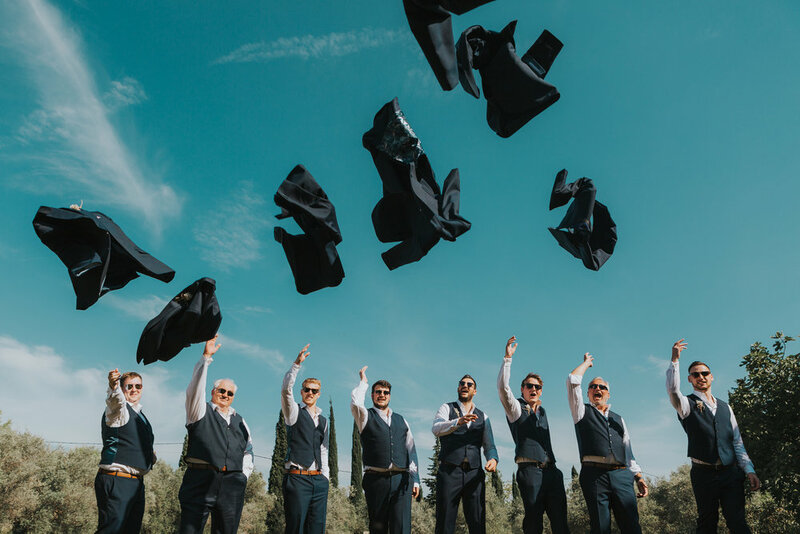 Get married all suited and booted but don't be afraid to relax the look after (you can always throw your jacket back on for group photos and move your button hole onto your waistcoat to smarten it up). No a fan of what you assume to be a wedding buttonhole? Or maybe just strip it back to a simple yet sophisticated look; Baby's breath is a popular choice for bouquet fillers, not only because of how inexpensive it is in comparison to other 'filler flowers' but because of its beautiful understated look. These dried baby's breath buttonholes add a touch of elegance to a relaxed grooms look. They were much easier to transport, store and keep for their Destination wedding too! Missing loved ones have many ways to be present during your special day, the photo above is actually my husband getting ready for our own wedding day; beautifully captured by my friend Michelle. He was so close to his grandparents, but unfortunately they never got the chance to see the two of us marry. This was a simple way for him to include them on his day, on the inside of his suit jacket, close to his heart. A small detail that really only close friends and family were aware of, but something so small can have such a big meaning behind it. Or maybe you have an heirloom of some sort you wish to wear or have on your day, from pocket watches to an old penny stitched into the lining of a grooms breast pocket, I've seen many different heirlooms but I have to admit, my favourite was Simon's grandfather's old cane, and boy did he rock it! Choosing to have full tails and a top hat for his own attire, the cane perfectly added to his style and he carried it with him throughout his wedding day, never missing an opportunity to strike a pose with it! So if you do have an heirloom, ROCK IT! and make sure the photographer knows to capture it! 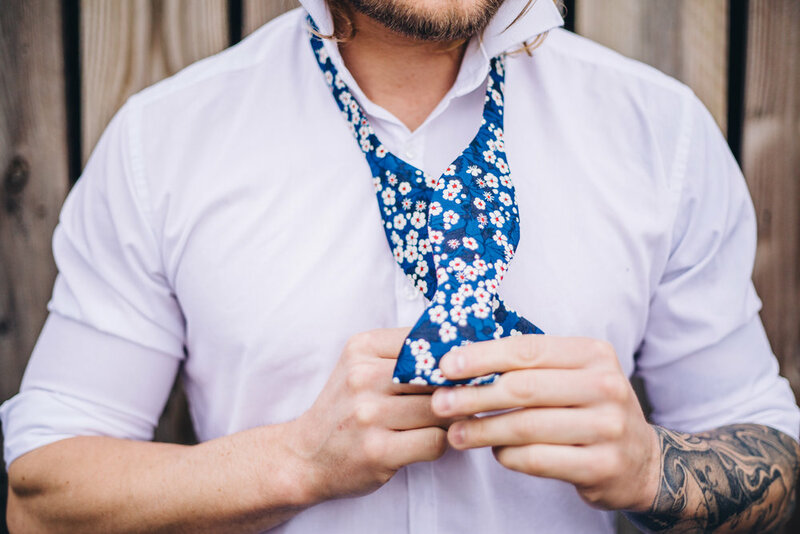 Sometimes the simplest of changes can make the most impact....a fabric for your pocket square or tie can really set the tone and add a splash of colour and personality to your outfit. Don't be afraid to have a look around, you maybe surprised at what catches your eye. A suit can really be unique with just a few tweaks and additions; and these wonderful pieces by Catkin Jane can really add a splash of colour to any attire. Be True to yourself and ROCK IT!